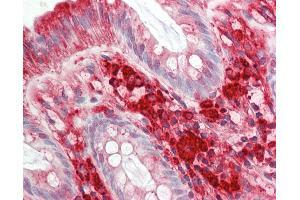 Human Colon: Formalin-Fixed, Paraffin-Embedded (FFPE). This image was taken for the unconjugated form of this product. Other forms have not been tested. Immunogène Synthetic peptide from C-Terminus of human RAC1 (P60763, NP_008839). Percent identity by BLAST analysis: Human, Chimpanzee, Gorilla, Gibbon, Monkey, Galago, Marmoset, Mouse, Rat, Sheep, Elephant, Panda, Dog, Bovine, Bat, Rabbit, Horse, Pig, Opossum, Guinea pig, Turkey, Zebra finch, Chicken, Platypus, Lizard, Xenopus, Trout, Seabass, Catfish, Salmon, Smelt, Stickleback, Pike, Zebrafish (100%), Sea squirt, Drosophila, Slime mold, Nematode, Beetle (92%).